PDG is proud to be recognized as one of the top companies in our industry. Our strong partnership and collaboration with our clients are crucial to our success. 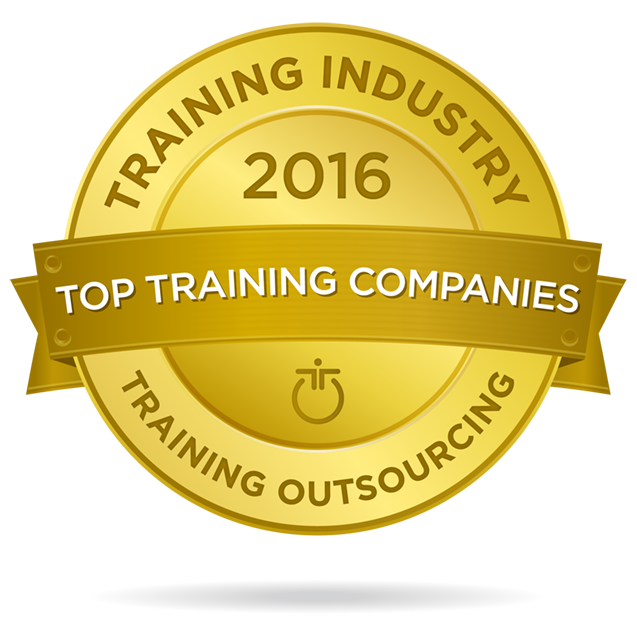 For the fourth consecutive year, PDG was named to the Training Industry Top 20 Training Outsourcing Companies List. Selection to the list was based on industry visibility, innovation and impact; the capability to deliver multiple types of training services; company size and growth potential; strength of clients; and geographical reach. 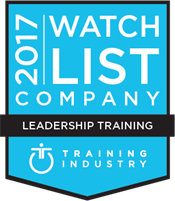 For the fourth consecutive year, PDG was named to the Training Industry Leadership Training Companies Watch List. Selection to the leadership list was awarded to companies with the following criteria: new and innovative service offerings; unique approach to leadership development solutions; commitment to thought leadership; and quality of internal clients. 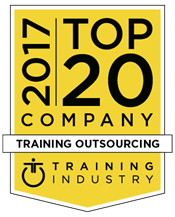 For the third consecutive year, PDG was named to the Training Industry Top 20 Training Outsourcing Companies List. Selection to the list was based on industry visibility, innovation and impact; the capability to deliver multiple types of training services; company size and growth potential; strength of clients; and geographical reach. 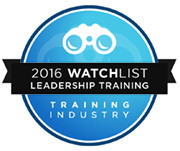 For the third consecutive year, PDG was named to the TrainingIndustry.com Leadership Training Companies Watch List. Selection to the leadership list was awarded to companies with the following criteria: new and innovative service offerings; unique approach to leadership development solutions; commitment to thought leadership; and quality of internal clients. 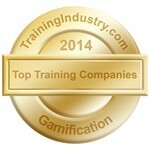 For the fourth consecutive year, PDG was named to the TrainingIndustry.com Top 20 Gamification Companies List. Companies who were selected for the gamification list provide innovative forms of gamification learning by integrating gaming into learning and development programs. Criteria for selection was based on features and capabilities of the gamification products/services; company size and growth potential; quality and number of clients; geographic reach; and awards, recognition and competitive differentiation. 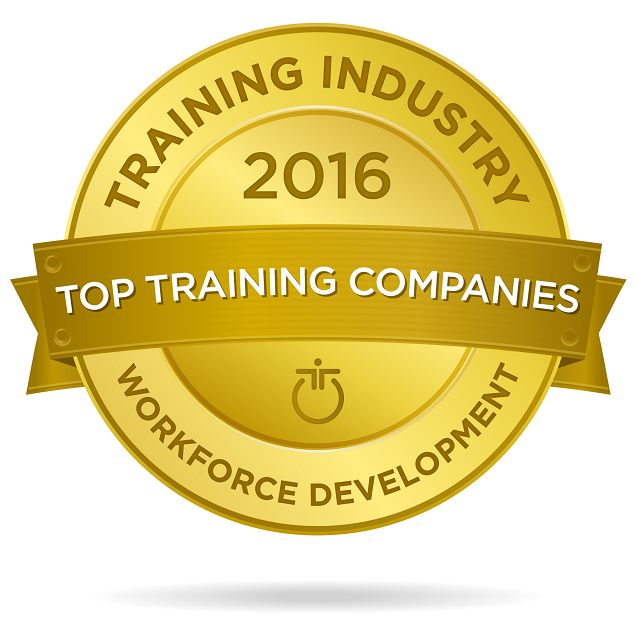 For the third consecutive year, PDG was named to the TrainingIndustry.com Top 20 Workforce Development Companies List. Selection to the list was based on industry visibility, innovation, and impact; the capability to deliver customized corporate training services; company size and growth potential; depth and breadth of subject matter expertise; quality of clients, and geographical reach. 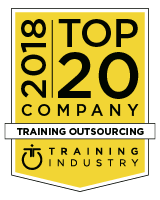 For the second consecutive year, PDG was named to the TrainingIndustry.com Top 20 Training Outsourcing Companies List. Selection to the list was based on industry visibility, innovation and impact; the capability to deliver multiple types of training services; company size and growth potential; strength of clients; and geographical reach. 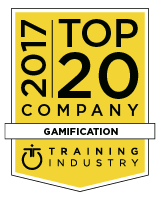 For the third consecutive year, PDG was named to the TrainingIndustry.com Top 20 Gamification Companies List. Companies who were selected for the gamification list provide innovative forms of gamification learning by integrating gaming into learning and development programs. Criteria for selection was based on features and capabilities of the gamification products/services; company size and growth potential; quality and number of clients; geographic reach; and awards, recognition and competitive differentiation. PDG was named to the TrainingIndustry.com Top 20 Gamification Companies List. Companies who were selected for the gamification list provide innovative forms of gamification learning by integrating gaming into learning and development programs. Criteria for selection was based on features and capabilities of the gamification products/services; company size and growth potential; quality and number of clients; geographic reach; and awards, recognition and competitive differentiation. PDG and MedImmune won third place in the Top Training Video (Ttv) awards program. The winning video was The Importance of Documenting Experiments. Companies were asked to send in a two-minute training video clip. Training received nearly 140 video clip submissions. Nine 2014 Emerging Training Leaders, and an additional industry expert, judged the submissions. PDG was named to the TrainingIndustry.com Top 20 Workforce Development Companies List. Selection to the list was based on industry visibility, innovation, and impact; the capability to deliver customized corporate training services; company size and growth potential; depth and breadth of subject matter expertise; quality of clients, and geographical reach. 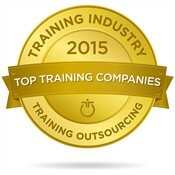 PDG was named to the TrainingIndustry.com Top 20 Training Outsourcing Companies List. Selection to the list was based on industry visibility, innovation and impact; the capability to deliver multiple types of training services; company size and growth potential; strength of clients; and geographical reach. 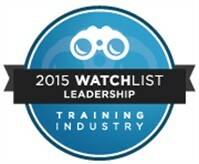 PDG was named to the TrainingIndustry.com 2015 Leadership Training Companies Watch List. Selection to the leadership list was awarded to companies with the following criteria: new and innovative service offerings; unique approach to leadership development solutions; commitment to thought leadership; and quality of internal clients. 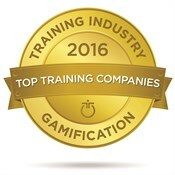 PDG was selected as one of the top 20 gamification companies by TrainingIndustry.com. Selection to this year’s Top 20 Gamification Companies was based on features and capabilities of gamification products and services; company size and growth potential; quality and number of clients/users; geographic reach; and awards, recognition, and competitive differentiation. PDG was listed as a top workforce development company by TrainingIndustry.com. Selection to this year’s Top 20 Workforce Development Companies List was based on industry visibility, innovation and impact; capability to develop and deliver customized corporate training services; company size and growth potential; depth and breadth of subject matter expertise; organization size and growth potential; quality of clients; and geographic reach. 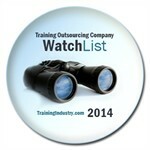 PDG was recognized as a top training outsourcing provider by TrainingIndustry.com and is listed on Training Outsourcing Companies Watch List. 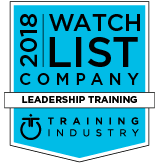 Selection to this year’s Training Outsourcing Companies Watch List was based on the following criteria: industry visibility, innovation and impact; capability to deliver multiple types of training services; company size and growth potential; strength of client’s geographic reach. PDG is recognized by the prestigious Chief Learning Officer Magazine Awards for world-class quality for realistic simulations created for two organizations. Chief Learning Officer Magazine recognized PDG for a “day-in-the-life” simulation project for Iron Mountain, used to train records management drivers, as well as a Fetal Strip Monitoring series created for Universal Health Services (UHS), designed to evaluate nurses on the use of fetal monitoring equipment during patient pregnancy. 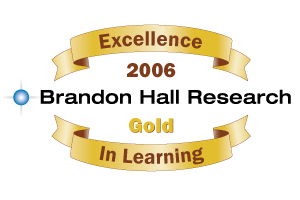 PDG wins the Brandon Hall Gold Excellence Award in Sales and Marketing along with Novo Nordisk for their partnership in creating the Diabetes Sales Academy (DSA). DSA was recognized as Best Program for Sales Training and Performance. PDG conducted a needs analysis, created a learning map and curriculum, as well as a change management plan to drive real change. PDG helped Novo Nordisk realize their vision to transform their sales force into one that physicians recognize as the industry’s most effective and trusted in diabetes care. PDG is recognized once again by Brandon Hall for the creation of a sophisticated employee performance management simulation for Unisys. The simulation allows managers to practice key skills in goal setting, providing feedback, performance review, and setting compensation. The simulation serves as both a learning tool and an ongoing performance support tool. PDG wins an unprecedented four years in a row, bringing home two Brandon Hall awards. 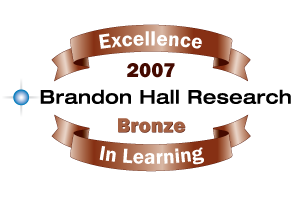 One of the 2009 awards is for Field Sales Compliance Simulation 1, part of a series of selling simulations for Wyeth Pharmaceuticals. Rather than dry procedural training, the simulation demonstrates how to apply appropriate compliance practices within a smart and effective selling process. PDG wins a Brandon Hall award for the second straight year, recognized for helping Automated Data Processing (ADP) teach their managers good employee development skills with the LearningEDGE Associate Development Simulation. Managers coach and develop a team over a simulated year, using tools from the LearningEDGE Human Capital Management System. PDG gets the Gold in their first Brandon Hall entry, a simulation developed to help sales reps for Wyeth Pharmaceuticals bridge the gap between learning and performance. Wyeth reps learned and practiced portfolio selling skills in realistic and interactive sales calls with video-based doctors and other health care professionals. The simulation provided real-life application of new skills and accelerated time to real-life performance. PDG introduces our Strategic Learning Partnership offering, focused on providing our clients with a 21st century learning solution focused on the needs of modern learning organizations. The SLP approach provides models for demand planning, organizational structure, governance, learning administration and a range of managed learning and resourcing plans designed to fit the needs of diverse organizations. PDG introduces our Contact Center solution. Driving a great customer experience is critical in today's online-oriented world, and the Contact Center agent is the primary conduit to the company for many customers. PDG's solution is focused on rapid and high-impact onboarding to the job and career-long skills development to create a new breed of Super-Agents! PDG continues to grow our Managed Learning Services business, nearly doubling the number of resources deployed to client locations across the United States and around the world. PDG helps create measurable impact in key metrics, such as improved time to productivity, cost reduction due to shared services & centralization, observed improvement in manager performance, and higher customer service rankings. PDG introduces the Gold Standard Learning Process, a next generation model that focuses on moving from Learning to measurable Performance Impact. PDG moved to the next level in its growth by adding a Board of Directors to provide governance and strategic guidance. With deep expertise in growing business-to-business enterprises, the members of the board helped shape business and growth strategies to reach PDG’s short and long term goals. PDG continued to grow and develop with the changing marketplace and economic demands of the industry. In order to facilitate a more flexible PDG, president Keith Forshew joined the team, bringing a long history of customer focus and sustainable growth. Under Keith’s leadership, PDG used its strength as a learning consultancy to focus on changing behavior in organizations in order to drive key business metrics. Learning continued to be a core part of the PDG business strategy as PDG provided businesses with learning strategies, solutions, and implementation. PDG’s Learning Outsourcing business grows over 400% between 2010 and 2012, as PDG adjusts its business mission to meet the needs of its clients. In a world where organizations have critical needs but limited resources, PDG provides value by providing the experienced professionals, optimized learning processes, and proprietary development and management tools that organizations need to succeed. PDG provides a wide array of learning outsource services, from a single course to an entire curriculum to an entire learning capability. PDG begins a partnership with a global pharmaceutical company to drive improvements in their manufacturing process. PDG creates a current state analysis and recommendations for improvement. Based on that, the company engages PDG to create both the structure and the content for a new corporate university. PDG’s strategic engagements team also fields the operations team that runs the logistics of the university. At the end of the university’s first full year operation (2011), the company reports a 30% reduction in manufacturing errors for the pilot group. PDG acquires effectPerformance, Inc. and significantly increases our presence within the financial services industry. PDG submits one of our financial services simulations to Brandon Hall Research and takes home the Gold. Clients begin asking PDG to present ideas for how to better engage customers through education and performance support tools. PDG begins creating experiences to drive customer performance as well as workforce performance. PDG closes a multi-tier engagement to create, staff, and run the Project Center of Excellence within the sales training department of a large pharmaceutical company. To support increasing requests for PDG to take more ownership of staff augmentation projects, PDG begins its outsourcing line of business and moves the staff augmentation team under the outsourcing team. PDG is asked to provide change management services to help pull through the performance solutions we developed for a client and begin our organizational change management practice. For the first time, PDG submits one of our programs for an industry award and wins the Gold from Brandon Hall Research for our Pharmaceutical Selling Simulation. Demands for workforce compliance solutions increases sharply within our life sciences and financial services areas of business and PDG begins offering solutions targeted for the compliance function within our customers. PDG adds Sovereign (now Santander), Wyeth (now Pfizer), Independence Blue Cross, and Merck as initial customers. PDG launches services for the financial services industry and adds Sovereign (now Sovereign Santander) as a client. The need for technology-delivered application exercises drives demand for our performance simulation services. PDG evolves our platform to create a powerful simulation engine. PDG enters into our first insourcing agreement with Wyeth (now Pfizer). The engagement grows and begins providing our clients with staff augmentation services. Quaker Chemical contracts with PDG for consulting services on LMS selection and implementation as well as curriculum design. PDG sees an increasing need in the marketplace for these services and begins offering our clients performance-consulting services. PDG develops services to meet the needs of the life sciences industry and quickly adds Wyeth (now Pfizer), Merck, CSL Behring and ViroPharma as key clients. PDG is founded in February of 2002 and begins operations as a high-end provider of custom training, simulation, and performance support solutions. Unisys and Bentley Systems come onboard as PDG’s first clients.